Vollrath has continued to be a leader in induction cooking by introducing an extensive line of countertop and drop-in induction ranges, soup warmers, re-thermalizers, fajita heaters, chafers, buffet tables, among many other products. Eliminating open flames by using induction cooking makes kitchens so much safer, without reducing performance. 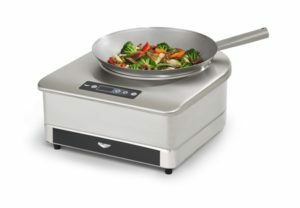 Additionally, induction cooking has quick temperature response, featured by the “turbo button” that the Vollrath Wok Range employs. With simple, digital power-level controls, the Wok Range has 100 power settings for ultra-precise cooking. The contour of the cooking surface matches common industry standards, but the Wok Range also comes with a Vollrath 14” carbon steel wok, a perfect match for the Wok Range.